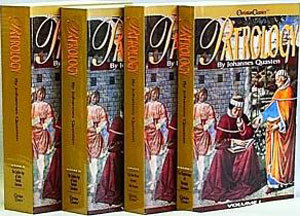 IGNATIUS CATHOLIC STUDY BIBLE Complete set (so far) of twelve volumes. As described elsewhere this has a retail value of $143.40. Study groups: please inquire for quantity pricing on individual books. Call 1 800 772 5928 or e-mail books4u@airmail.net. 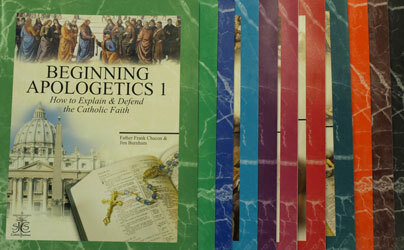 Buy the complete set of BEGINNING APOLOGETICS ( 9 volumes) plus the study guide for volume 1 and save. Full price is $57.50. Churches wishing to order multiple copies for classes please call 1-800-772-5928 to receive your church discount. Possibly the best introduction to early Christian literature available. Paper. Suggested retail for all four volumes is $167.80. LITTLE ANGEL READER Catholic Phonics Series for Grades K-2 by Linda Bromeier, M.Ed. Complete set of four readers, four workbooks and teacher’s manual at a special price. Beautifully illustrated in full color, these readers have word drills and phonetic stories that will teach your little one to read while supporting their faith. Retail value $114.25. We ask this through Christ Our Lord. Amen."